A wide variety of commerical/office property is available in Suisun City for sale or lease in mixed-use and traditional configurations in the Waterfront District or in the Sunset Avenue Commerical Hub. Variety is a hallmark of the prime commerical and office space available in Suisun City. Located just two miles from Interstate 80 halfway between the Sacramento Metro Region and San Francisco Bay Area with Solano County's only Capitol Corridor commuter rail stop, Suisun City is the place for businesses serving Northern California. Harbor Square is the centerpiece of the most recent phase of redevelopment that is restoring the economic vitality to the pedestrian-oriented Waterfront District. This stunning mixed use development includes retail, restaurant and office opportunities surrounding a landmark courtyard featuring the region's tallest outdoor fireplace. For more information on Harbor Square and Main Street West visit www.mainstwest.com or call 707-425-4975. 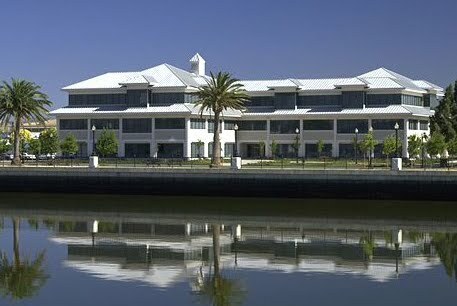 The flagship of the Waterfront District is One Harbor Center, a 50,000 square foot, three-story professional office building overlooking the water. Adjacent to the Capitol Corridor train station, ample parking, hotel accomodations and an easy walk from a variety of independent restaurants, One Harbor Center is a terrific location for your business. For more information on One Harbor Center, go to www.wisemanco.com or call 707-427-1212. 333 Sunset is decidedly a landmark building in Solano County and the commerical/office anchor of the Sunset Avenue Commerical Hub. The three-story 72,000 square foot luxury office complex offers a wide range of space with nearby highway access and adjacent to retail outlets. For more information on 333 Sunset, visit www.333sunset.com or call 925-283-8584. Suisun City has a reputation for facilitating commercial development and working with businesses on ideas that may not fit a standard formula. For broad inquiries on development or business opportunities, email Economic Development Director Jason Garben at jgarben@suisun.com or reached him by phone at (707) 421-7309.